Why is it that some humans persist in killing those of other ethnic groups or other religions? I know that power and corruption is part of the cause, but it takes a whole lot of hatred to spend one’s life in the pursuit of killing innocent families. At least the Christians gave up slaughtering heretics and muslims hundreds of years ago. Islamic militants seem hell-bent on starting up Christian/Muslim wars. Don’t they realise most of us respect people of different faiths? We may not agree with their belief systems but it doesn’t mean we want to kill them. What I cannot understand is why the Islamic militants are blowing up their own mosques and destroying their own culture. My heart goes out to the religious minority Christians living in Iraq. How terrifying must it be to know that you are being targeted and the country is in the hands of weak government. Iraqi bomber- note the cavalier treatment of this mass murderer! BAGHDAD (AP) — The toll from the bloody siege of a Baghdad church rose Monday to 52 dead with dozens more injured, Iraqi officials said. The standoff began at dusk Sunday when militants wearing suicide vests and armed with grenades attacked the nearby Iraqi stock exchange and then entered the nearby Our Lady of Deliverance church — one of Baghdad’s main Catholic places of worship — taking about 120 Christians hostage. Iraqi forces stormed the church after a tense hours-long standoff, freeing the hostages. It was not immediately clear whether the hostages died at the hands of the attackers or during the rescue. Officials said at least one priest and nine policemen were among the dead. Many of the wounded were women. 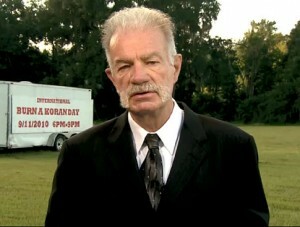 The casualty information came from police and officials at hospitals where the dead and wounded were taken. They spoke on condition of anonymity because they were not authorized to speak to the media. 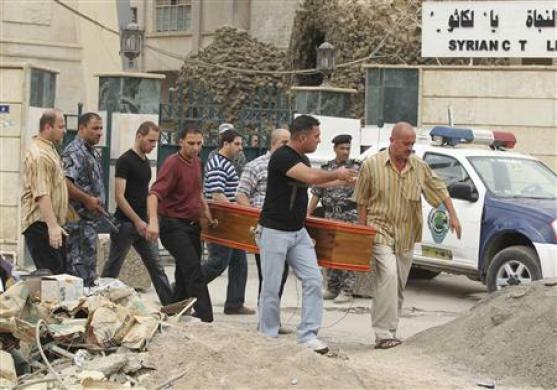 Photo below shows residents carrying empty coffin to pick up the dead from the Christian church. BAGHDAD – A string of bombings targeted Christian houses in Baghdad early Wednesday, killing at least four people and wounding 11 others, officials said. The attacks underscore the threat to Iraq’s minority Christian community following the church massacre last week that left 58 people dead. Al-Qaida militants claimed responsibility for that attack, and threatened more violence against the country’s Christians. Police said bombs went off near four houses belonging to Christians in the Iraqi capital’s predominantly Christian districts, police said. The officials said the bombs detonated within minutes of each other early Wednesday. The blasts come after a similar series of bombings late Tuesday that hit three empty houses belonging to Christians in western Baghdad, police officials said. No one was wounded in those bombings. Meanwhile, Iraq’s political leaders are preparing to meet for the third day in a row over the formation of a new government eight months after an inconclusive elections. Many believe militants are exploiting the political vacuum created by the politicians’ prolonged bickering over who should be the next prime minister.